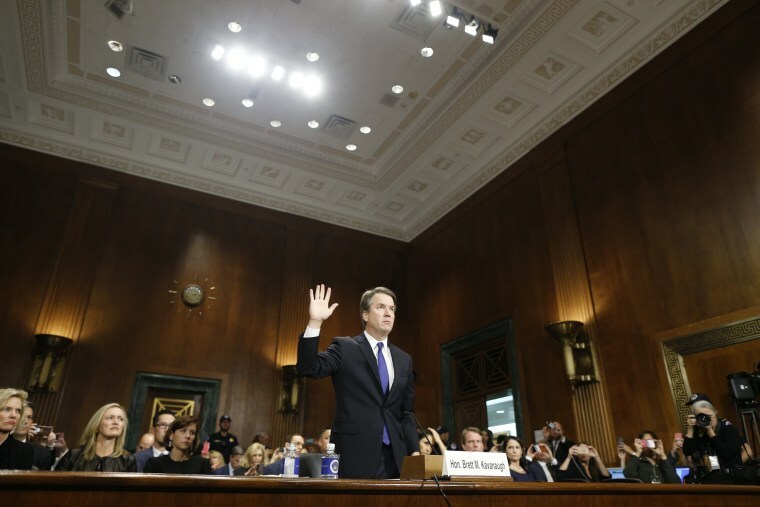 WASHINGTON — For all of the talk about who wins or loses if Supreme Court nominee Brett Kavanaugh is ultimately confirmed or defeated, we have a different take: After the allegations by Christine Blasey Ford, last week’s hearing and the new FBI investigation, almost everyone has already lost. If Kavanaugh gets confirmed, he heads to the U.S. Supreme Court with an indelible asterisk next to his name (and with more than 1,000 law professors signing a New York Times op-ed that he shouldn’t be confirmed). There’s also a good chance there will be future investigations into Kavanaugh if Democrats win control of Congress. And it will be hard to forget his “revenge on behalf of the Clintons” and “what goes around comes around” lines. If Senate Majority Leader Mitch McConnell pushes Kavanaugh across the finish line, he’ll get another nominee on the court by a party-line (or close to it) vote — but at great cost to the Supreme Court’s legitimacy, especially after Merrick Garland. If President Trump gets his man, he’ll have united Republicans, but he possibly also exposed Senate and House candidates in blue/purple/urban/suburban areas, as well as some current GOP senators (up for re-election in 2020 and beyond) who might not have wanted to take this vote. On the other hand, if Senate Democrats ultimately defeat Kavanaugh — with help from Sens. Jeff Flake, R-Ariz., Susan Collins, R-Maine and Lisa Murkowski, R-Alaska — it will have come at great cost to red-state Democrats (like Heidi Heitkamp) who desperately wanted to vote for a generic GOP Supreme Court nominee. And no matter if she votes yes or no, this nomination has put Sen. Collins in a terrible spot — in either a GOP primary (if she votes no) or a 2020 general election (if she votes yes). So almost everyone is worse off today than they were on September 16, when Christine Blasey Ford’s allegations first surfaced in the Washington Post. And as we wrote last week, the entire episode — especially the painful Ford-Kavanaugh testimony on Capitol Hill — never had to happen. Trump could have thrown in the towel and nominated another of his finalists (Thomas Hardiman or Raymond Kethledge); McConnell could have pulled the plug; and Kavanaugh could have said that NONE of this was worth it. FBI's Kavanaugh report submitted: What happens next? And that’s maybe the biggest reason why we should *expect* Kavanaugh to get confirmed. Here’s one other reason why Kavanaugh probably gets confirmed: Everyone, particularly on the GOP side, wants this over with. In addition, NBC’s Peter Alexander says, according to a source briefed on the FBI’s completed investigation, the bureau contacted 10 people and interviewed nine of them (it’s unclear why the 10th wasn’t interviewed). And the source says the White House concluded that the interviews do not corroborate sexual misconduct allegations against Kavanaugh. Of course, that’s just one side talking — and before others have read it. What’s in the FBI report and who gets to read it? Christine Ford’s attorneys released this statement last night: “An FBI supplemental background investigation that did not include an interview of Dr. Christine Blasey Ford — nor the witnesses who corroborate her testimony - cannot be called an investigation. We are profoundly disappointed that after the tremendous sacrifice she made in coming forward, those directing the FBI investigation were not interested in seeking the truth." White House Press Secretary Sarah Huckabee Sanders on Wednesday defended President Trump mocking Christine Blasey Ford in Mississippi, saying the president was just stating the facts. "The President was stating the facts, included in the report. Stating facts that was in the testimony." While Ford indeed couldn't remember certain details from 1982, the president wasn't just stating the facts in his remarks last night. Trump on Tuesday: "How many years ago was it? I don't know." Ford in her Senate testimony: "In the summer of 1982, like most summers, I spent most every day at the Columbia Country Club in Chevy Chase, Maryland, swimming and practicing diving. One evening that summer…"
Trump on Tuesday: "Upstairs, downstairs, where was it? I don't know." Ford in her Senate testimony: "Early in the evening, I went up a very narrow set of stairs leading from the living room to a second floor to use the restroom. When I got to the top of the stairs, I was pushed from behind into a bedroom across from the bathroom. I couldn’t see who pushed me. Brett and Mark came into the bedroom and locked the door behind them." Trump on Tuesday: "But I had one beer. That is the only thing I remember." “DURBIN: Dr. Ford, with what degree of certainty do you believe Brett Kavanaugh assaulted you?